Guam is home to a number of intriguing historical sites, including some underwater ones — thanks to its involvement in World War II. Divers will relish exploring wrecks like the Tokai Maru and the American Tanker, both of which were cargo ships that sunk during the war. Also, don’t miss out on other iconic dive spots like the Blue Hole, where clear waters and marine animals like curious reef sharks and massive tuna await you. Guam’s food is inspired by the cuisines of its neighboring territories, which include the Philippines, Japan and Hawaii. Whet your appetite with dishes like red rice (achiote seeds, onions and garlic) and kadon pika (a spicy stew of chicken in soy sauce, coconut milk, vinegar, garlic and hot peppers), to name just a few. Recommended restaurants include Table 35 Restaurant + Bar (665 South Marine Corps Dr, Tamuning; +1 671 989 0350; table35guam.com) for great seafood; Mosa’s Joint (101 Quan Building, 324 West Solidad Ave, Hagatna; facebook.com/mosasjoint) for local dishes and excellent burgers; and Meskla DOS (413 A&B North Marine Corps Dr, Tamuning; +1 671 646 6295; mesklados.com) for Guam-style barbecue platters. For Instagram-worthy shots, there’s no better place to be than Guam’s lookout points. Popular ones include Cetti Bay Overlook located off Highway 2A; Ritidian Point, which is the northernmost point on the island; and Two Lovers Point, which overlooks Tumon Bay and offers stunning views of both the coast and the city. If you’re a history buff, check out the Guam Pacific War Museum (6 Hagatna; +1 671 477 8355). It may seem small on the outside, but inside you’ll find a slew of incredible WWII artefacts, from weapons and the personal belongings of troops to remnants of airplanes. If that’s not enough, add to your itinerary other historic spots like Yokoi’s Cave in Talofofo Falls Park (where Japanese soldier Shoichi Yokoi hid for almost three decades after the end of World War II) and Agat Beach (the southern landing site of American forces in the Battle of Guam in 1944). When in Guam, it’s a must to spend time on the beach. 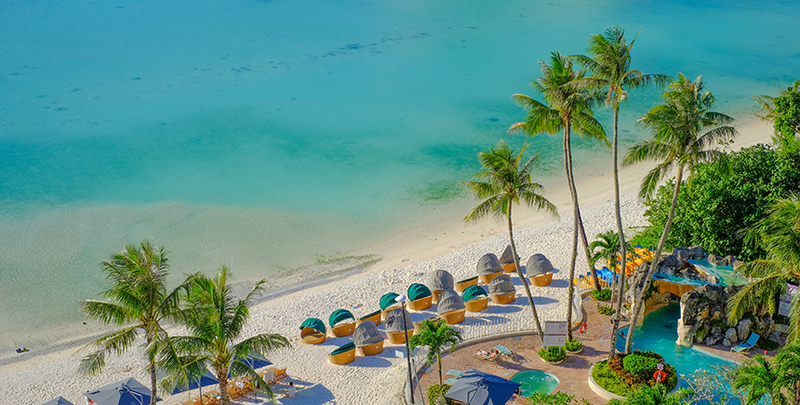 There are many stretches of sand to choose from: popular Tumon Bay Beach draws the biggest crowds, while Agana Bay Beach is perfect for families, thanks to its shallow reef lagoon. If you’re looking to sweat it out, check out Sharks Cove Beach, as you’ll need to embark on a half-mile hike to reach its shores. 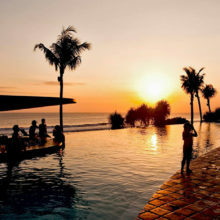 Then there’s also beautiful Inarajan Pools Beach, whose calm waters are ideal for first-time snorkelers. 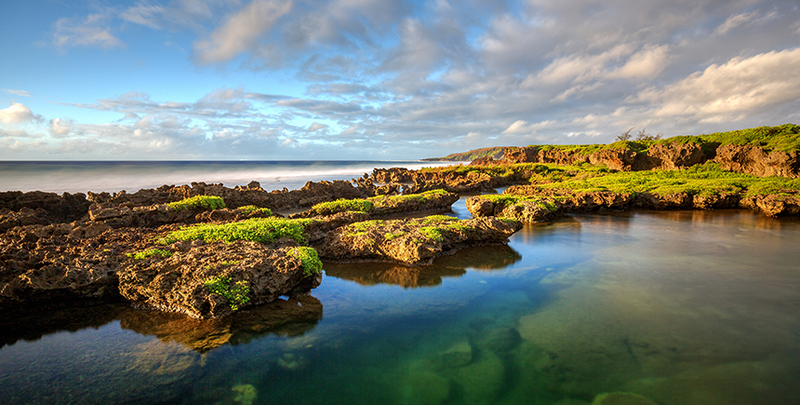 There are more than 20 villages in Guam, which make for perfect entry points to the nation’s rich history and culture. Start off at Umatac, which is home to the legendary Fouha Rock — believed to be the resting place of a goddess named Fu’una — and other military structures like the Guam Veterans Memorial, which is dedicated to soldiers who died during the Vietnam War. Another village that’s worth visiting is Agat, where you’ll find several parks commemorating the events of World War II. Guam has several trails for you to conquer, ranging from easy walks to challenging routes. If you only have time for one, pick Mount Lamlam (Agat), whose name translates to “lightning” in Chamorro. At 1,332ft high, this is the island’s tallest peak. It’s also often referred to as the world’s highest mountain — if only because the distance from its peak to the bottom of nearby Mariana Trench represents the biggest change in elevation on Earth. It’ll take you around four hours to hike up and down the mountain. Whether you’ve got little ones with you or just want to satisfy your inner child, the Tarza Waterpark (132 Pale San Vitores Rd, Tamuning; +1 671 649 6150) makes for a fun day out. Complete with exhilarating water slides, a lazy river and plenty of F&B options, this is a good spot to park yourself if you want some easy-access R&R.